Social Icons Type: Choose your social icons type from given styles. Those styles are square, rounded, circle or transparent. 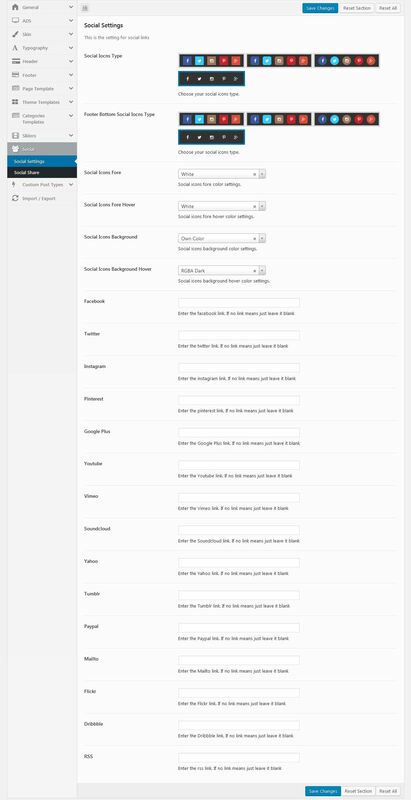 Footer Bottom Social Icons Type: Choose your social icons type from given styles. Those styles are square, rounded, circle or transparent. Social Icons Fore: Select your social icons color like white, black or own color. Social Icons Fore Hover: Select your social icons hover color like white, black or own color. Social Icons Background: Select your social icons background color like white, black, light, dark, or own color. Social Icons Background Hover: Select your social icons background hover color like white, black, light, dark, or own color. Face book: Enter your face book link. If no link means just leave it blank. Twitter: Enter your twitter link. If no link means just leave it blank. Instagram: Enter your instagram link. If no link means just leave it blank. Pinterest: Enter your pinterest link. If no link means just leave it blank. Google Plus: Enter your googleplus link. If no link means just leave it blank. YouTube: Enter your YouTube link. If no link means just leave it blank. Vimeo: Enter your vimeo link. If no link means just leave it blank. Sound cloud: Enter your soundcloud link. If no link means just leave it blank. Yahoo: Enter your yahoo link. If no link means just leave it blank. Tumblr: Enter your tumblr link. If no link means just leave it blank. PayPal: Enter your PayPal link. If no link means just leave it blank. Mailto: Enter your mailto link. If no link means just leave it blank. Flickr: Enter your flickr link. If no link means just leave it blank. Dribble: Enter your dribble link. If no link means just leave it blank.